In a recent edition of the Los Angeles Times Travel Show the expert travel and tourism writer praised the Riviera Nayarit, positioning it at the top of the list of where to travel for 2014. Not content with placing the Riviera Nayarit among the most important destinations to visit in 2014 on his website, www.frommers.com, the internationally recognized travel and tourism expert Arthur Frommer took to the microphone at the Los Angeles Times Travel Show to praise the destination for himself. 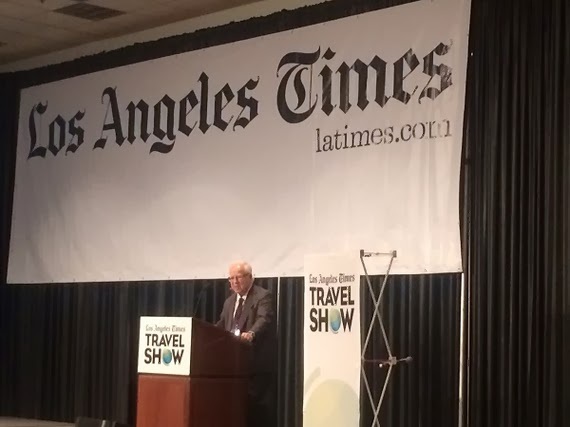 During an event that took place in the Los Angeles Convention Center, Frommer used his turn on the stage to expand on on the many attractions of Mexico’s Pacific Treasures, this according to travel expert and founder of the “World Travel List,” Nicholas Kontis, in his article on www.huffingtonpost.com. “As anybody with a pulse on travel knows, “when Frommer speaks, travelers, industry insiders and the world listens,” stated Kontis in his article. During his speech, Frommer singled out Nayarit’s hundreds of kilometers of beaches, the more than 300 sunny days a year, visitor safety and the hotel infrastructure. “Not too surprising that the Mexican government is on a mission to build up this 200 mile stretch of land into the next tourist gateway for foreigners traveling to Mexico,” states the article, echoing Frommer’s own words. “The Marietta Islands are a treasure for snorkelers, divers, and fishermen and one of the many gems in the state of Nayarit. The once sleepy fishing village of Sayulita is now a ‘surfer’s paradise,’ and one of the many vibrant areas within an hour’s reach of Puerto Vallarta,” it continues. Accordingly, Marc Murphy, the Managing Director of the Riviera Nayarit Convention and Visitors Bureau (CVB) commented that it’s an honor to have someone as important as Arthur Frommer not only publish articles on the destination, but also highlight the Riviera Nayarit during his presentations.